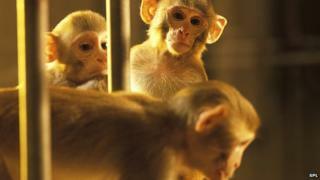 The brain of one monkey has been used to control the movements of another, "avatar", monkey, US scientists report. Brain scans read the master monkey's mind and were used to electrically stimulate the avatar's spinal cord, resulting in controlled movement. The team hope the method can be refined to allow paralysed people to regain control of their own body. The findings, published in Nature Communications, have been described as "a key step forward". Damage to the spinal cord can stop the flow of information from the brain to the body, leaving people unable to walk or feed themselves. The researchers are aiming to bridge the damage with machinery. The scientists at Harvard Medical School said they could not justify paralysing a monkey. Instead, two were used - a master monkey and a sedated avatar. The master had a brain chip implanted that could monitor the activity of up to 100 neurons. During training, the physical actions of the monkey were matched up with the patterns of electrical activity in the neurons. The avatar had 36 electrodes implanted in the spinal cord and tests were performed to see how stimulating different combinations of electrodes affected movement. The two monkeys were then hooked up so that the brain scans in one controlled movements in real time in the other. The sedated avatar held a joystick, while the master had to think about moving a cursor up or down. In 98% of tests, the master could correctly control the avatar's arm. One of the researchers, Dr Ziv Williams, told the BBC: "The goal is to take people with brain stem or spinal cord paralysis and bypass the injury. "The hope is ultimately to get completely natural movement, I think it's theoretically possible, but it will require an exponential additional effort to get to that point." He said that giving paralysed people even a small amount of movement could dramatically alter their quality of life. The idea of one brain controlling an avatar body is the stuff of blockbuster Hollywood movies. However, Prof Christopher James, of the University of Warwick, dismissed a future of controlling other people's bodies by thought. He said: "Some people may be concerned this might mean someone taking over control of someone else's body, but the risk of this is a no-brainer. "Whilst the control of limbs is sophisticated, it is still rather crude overall, plus of course in an able-bodied person their own control over their limbs remains anyway, so no-one is going to control anyone else's body against their wishes any time soon." Instead, he said this was "very important research" with "profound" implications "especially for controlling limbs in spinal cord injury, or controlling prosthetic limbs with limb amputees". Realising that goal will face additional challenges. Moving a cursor up and down is a long way from the dextrous movement needed to drink from a cup. There are also differences in the muscles of people after paralysis; they tend to become more rigid. And fluctuating blood pressure may make restoring control more challenging. Prof Bernard Conway, head of biomedical engineering at the University of Strathclyde, said: "The work is a key step forward that demonstrates the potential of brain machine interfaces to be used in restoring purposeful movement to people affected by paralysis. "However, significant work still remains to be done before this technology will be able to be offered to the people who need it."